Carol McDermott - San Juan Publishing Group, Inc.
An an accomplished writer, editor, and contributor to many local publications, Carol McDermott is also a well known and well-respected woman who is active in many civic organizations in her hometown, Montrose, Colorado. She’s served on the City Council, where she wore the mayor’s hat for a term. 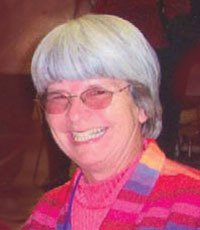 Although retired from teaching, Carol continues to teach college classes and tutor and produces works for professional teachers and books for children. During the summer, she is Montrose’s ‘Main in Motion’ storyteller. As for her wonderful, whimsical poetry, Carol says: “I write poetry to please myself.” Her poetry also pleases everyone who reads it! Carol grew up a “Navy brat” in Pearl Harbor, where her father was stationed. She claims she is Hawaiian, because she was born there, and continues to practice the Hawaiian culture, which is an integral aspect of her personality and her poetry. 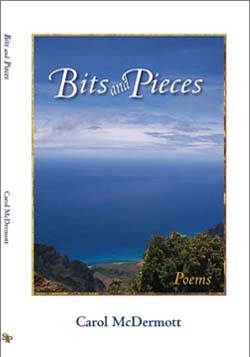 Bit’s and Pieces is also listed on Amazon. If you buy from Amazon, please leave a nice comment about Carol’s book. Carol’s book may be available at the following bookstores. Contact them first to see if they have her book in stock. ALL books available here, from our Bookstore, with secure PayPal purchase. Most books also available on Amazon. Click here or on cover below to learn more and order Bits and Pieces. Carol also has notecards of some of her poems. Contact her here for more information.